Since I’m a food photography blogger, I consider it my business to keep up with all the other food photography blogs out there in cyberspace. So from time to time, I scour the Internet looking for new food photography blogs. One of the things I’ve found is that there are very few blogs geared toward more advanced food photography. Most food photography blogs are geared toward the beginner, the food blogger, or someone interested in the very basics of food photography. I guess that is because there are more food bloggers than there are “professional” food photographers. I’ve compiled a list of what I consider the best food photography blogs on the Internet and I’ve given you a little description, from my point of view, of the strengths and weaknesses of each of these blogs. This is a partial list and if you know of any food photography blogs out there that I’ve missed I sure would appreciate you emailing me and letting me know the URLs of these food photography blogs. If you are a food photography blogger and you would like to have your blog listed on the site I be glad to do so. Just send me the URL and a brief description of your blog. I will be glad to consider it for inclusion on this list. Michael Ray’s food photography blog – I might be a little biased, but I consider this the best food photography blog for the “advanced” food photographer. I’m trying to give information to intermediate or advanced photographers, wedding photographers, or commercial photographers looking to make the jump into professional food photography. I know my niche is pretty small but I really don’t like spending time blogging about the simple subjects that don’t interest me. Does anyone know of any other sites giving “advanced” info? I’d love to see what they’re doing. The MDR Photography Classes Blog – This food photography blog is probably one of the very best food photography blogs out there. It’s heavily geared toward the novice but has some really good articles for the intermediate food photographer too. So if you’re just beginning your travels in food photography, or if you’ve been on it for just a little while, this would be a good place to start. The nice thing about this blog that it is produced by a professional food photographer. Some of the other blogs I’ve seen out there actually give you bad advice. This blogger gives you good advice, just not a huge amount of “advanced” advice. It’s not that she doesn’t understand food photography well enough to give advanced advice, I think it’s a decision she made to cater to the “novice” market. That’s probably a good business decision. There are a lot more novice food photographers out there than the ones that I’m trying to reach. 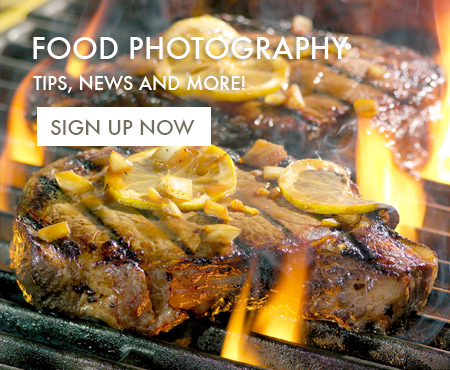 Learn Food Photography – This is a really interesting website. Quite a while ago the owner asked me if he could interview me for a podcast and I was glad to accept. I got to talk with him for little bit before the interview and I learned that he was an engineer that really had no background in food photography. I found that to be really interesting. Since then, I’ve listened to a couple of his other podcasts and I was sort of surprised at the questions that he asked each of these photographers. The quality of people that he was able to interview was quite impressive, but the quality of questions he asked disappointed me. There’s nothing wrong with not understanding food photography, but if you’re going to run a food photography blog, I would think you need to be an expert on food photography. I don’t know this for sure but I’m guessing he was either an avid enthusiast, trying to learn as much as he can, or he is in it as a business, or maybe both. One thing I will give him, is that he has put together a BUNCH of content together… I just looked and there is a recent post. Before today though, he hadn’t posted in the last months. It may be on its way out, but there is still some good content buried in its menus. Cookie and Kate Food Blog – This is another blog here toward food bloggers. There are a couple of interesting posts, but in general, it’s only for the beginner. There is some good information here but it is information that only food bloggers or very novice food photographers, would be at all interested in. There’s really nothing advanced for anyone looking for information about professional food photography. Did I miss any other food photography Blogs? These are the only food photography blogs I’ve run across that were worth mentioning. I’m sure there are some others that I missed, so if you know of any good ones, please contact me or leave a comment below. Help me make this a valuable resource for fellow food photographers. Please don’t leave suggestions on some social media platform. I may miss them. If your suggestions are good ones, I’d be glad to include them to my list. Thanks in advance, for the help!